SIGN HERE: Jim Baron has put together a petition to remove the Calliope camp, Homeground Villages Gladstone. 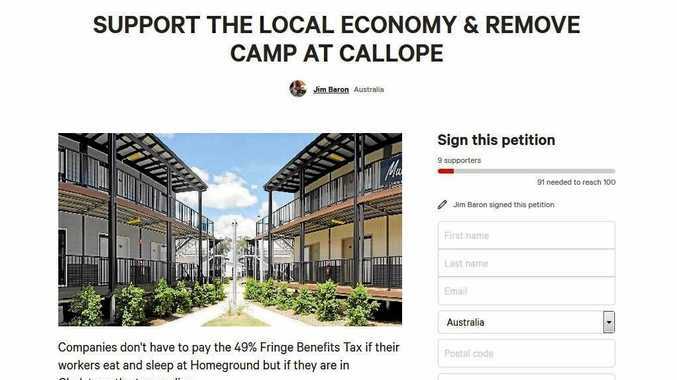 A PETITION calling for a Calliope workers camp to be shut down was launched at the weekend. The fresh calls to shut down Homeground Villages Gladstone came from CBS Property Group owner Jim Baron who claims the camp is robbing the region of $30 million a year. Last year the camp housed workers and contractors for ConocoPhillips and Rio Tinto Yarwun as well as the majority of the remaining Bechtel workers but it is unclear how many workers are currently staying there, and who their employers are. The Observer contacted Homeground Villages Gladstone for comment about the petition but received no reply. An Observer journalist attempted to gain entry into the Village but was turned away by staff. The $30million figure was arrived at by Mr Baron who calculated that the camp could house a minimum of 600 workers per night at $150 per night for 50 weeks (350 nights) a year. Without the camp, that money could possibly flow back into the Gladstone economy through accommodation, retail and hospitality. A Rio Tinto Yarwun spokeswoman said while Rio Tinto had incentives to hire locally for shutdown work and therefore its' workers were based in Gladstone accommodation, the company used Homeground when specialised skills were needed. "When we can't hire locally, for the reason that specialised skills are needed or just due to the sheer volume of the shut-down, we have used the Homeground because it's cheaper and has the ability to house a large group of workers at once," the spokeswoman said. "Also for its ability to manage a large volume of workers in a short period of time. "If local accommodation was to match those rates and have the ability to house a large number of workers in that time period we would be happy to speak with local companies." However, Mr Baron told The Observer he was waiting on support from the Gladstone region before providing any further comments. He is however not alone in his push to remove the camp. The Observer reported in July that estate agent Alicia Williams was also calling for its closure. She said if workers moved back into Gladstone they could keep the economy afloat but as long as they were kept in Calliope the town would continue to miss out. "There is just no need for those camps anymore, now the construction is over and the workers are here for maintenance," Ms Williams said in July. "There is a complete oversupply of houses and from the community point of view they should be putting money back into our local economy. A lot of people out there are in financial stress and don't know what to do." Earlier in February 2016, The Observer spoke to Harbour Sails Motor Inn owner Lawrie Maurer who said the camp "sucked" and nobody in town was picking up a dollar from it. "It's a pity because the whole town really needs it," he said in February. "What little business there is coming into town, we as a group in accommodation would like to get but it's going out there (to Homeground). "I understand companies are going for the cheaper option but if they were serious about doing something for Gladstone they would pay for them to stay in town." Employers pay fringe benefit tax on accommodation and food for their employees at a rate of 49%. Under the legislation, an employer has to pay the tax if the location of the accommodation is within 40km of a city the size of Gladstone. Homeground is about 28km away. But The Observer understands Homeground is classed as a remote area despite it being within the 40km zone because the road network used to calculate the distance is based on data from July 1986. This information is also mentioned in the petition, which will be handed over to the Gladstone Regional Council when it reaches at least 5000 signatures. At 3pm today the petition had attracted more than 100 signatures.